The San Bernardino County Department of Public Health will be providing free flu shots on Oct. 10, 24 and 31 from 10 a.m. to 1 p.m. 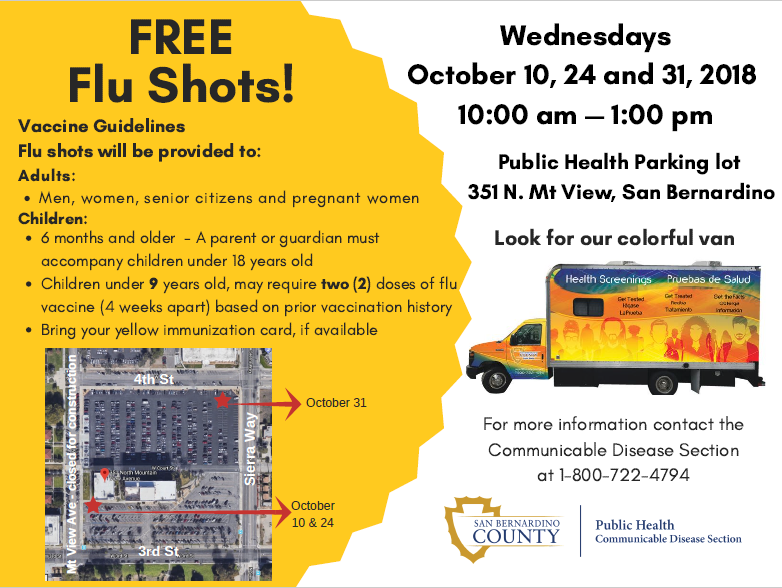 The flu shot clinic will be held in the Public Health parking lot at 351 N. Mountain View Avenue in San Bernardino — look for the colorful Public Health van. 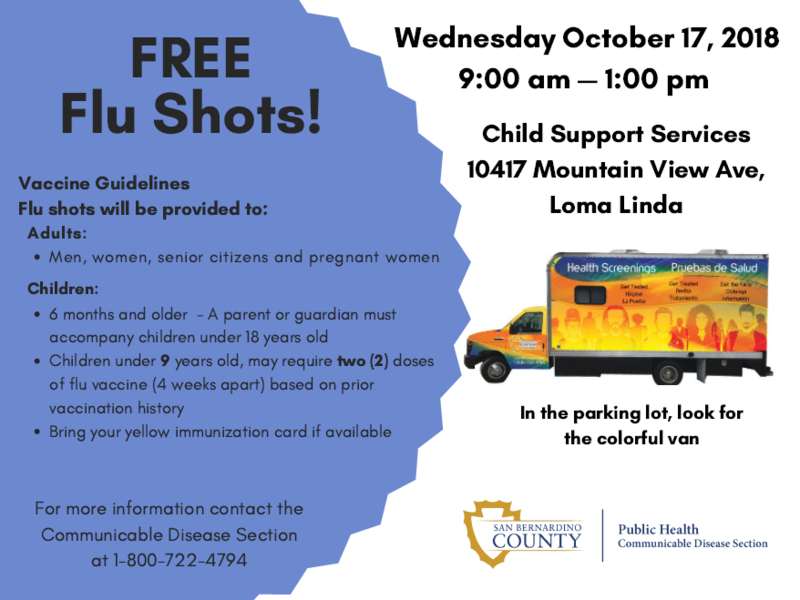 On Oct. 17 the flu clinic will be in the parking lot of the Child Support Services building on 10417 Mountain View Avenue in Loma Linda from 9 a.m. to 1 p.m. Flu shots will be provided to all adults, men, women, senior citizens, pregnant women and children who are six months old and older. A parent or guardian must accompany children under 18 years old. Children under 9 years old may require two doses of flu vaccine, four weeks apart, based on prior vaccination history. A yearly flu shot can reduce the risk of severe flu illness and its potentially serious complications. Getting the flu shot can also reduce doctor’s visits and missed work and school day due to flu illness. Last flu season (October 2017 to September 2018) there were 11 flu-related deaths in San Bernardino County. Nationally, CDC early estimates indicate that more than 900,000 people were hospitalized and more than 80,000 people died from flu last season (CDC https://www.cdc.gov/flu/spotlights/press-conference-2018-19.htm#ref1). These new estimates are record-breaking, and emphasize the seriousness and severity of flu illness and serve as a strong reminder of the importance of flu vaccination. For more information on the seasonal flu visit the Centers for Disease Control and Prevention page or for information on where to get a flu shot, visit the San Bernardino County, Department of Public Health events calendar or call at 1-800-722-4794.